Flexible Hybrid Electronics (FHE) combines the flexibility and low cost of printed plastic film substrates with the performance of semiconductor devices to create a new category of electronics. Join us for this informative Lunch 'N Learn* about Flexible Hybrid Electronics and how to apply FHE in biomedical, wearables and asset monitoring applications. Flexible hybrid electronics (FHE) is an innovative process that combines elements of the electronics industry with that of the high-precision printing industry. The NextFlex mission is to advance U.S. manufacturing of Flexible Hybrid Electronics (FHE). NextFlex delivers on this mission through public-private partnerships that facilitate technology innovation and commercialization, accelerate manufacturing workforce development, and promote a sustainable ecosystem for advanced manufacturing. By adding electronics to new and unique materials that are part of our everyday lives, combined with the power of thin silicon ICs, to create conformable and stretchable smart products, FHE is ushering in an era of “electronics on everything” and advancing the efficiency of our world. Taking advantage of the ability to conform to organic shapes, electronic capability can now be incorporated into new and emerging consumer and industrial products, and, combined with rapid advancements in data analytics and artificial intelligence, can enable real-time decision. FHE and printed electronics can also realize the promise of manufacturing electronics in higher volume at lower costs. The term "hybrid" refers to designs that have both printed and semiconductor based components, allowing the device to process data and utilize the most cost effective componentry. 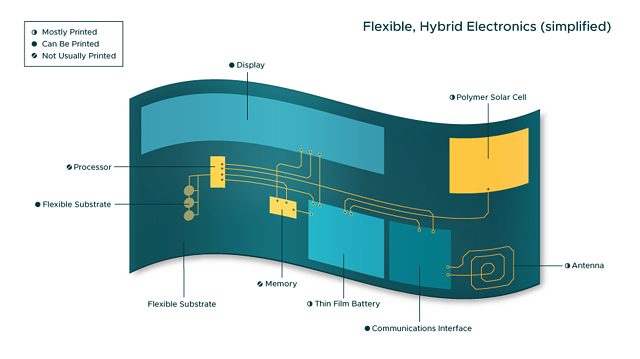 The diagram below illustrates this concept where some devices are printed onto the flexible substrate, and some are placed. Although many advancements have been made in FHE, new materials, processing, equipment, and design are needed to bring today’s product concepts to reality. Interestingly, many of these advancements span across previously unrelated industry segments. For example, electronic printing inks bring together techniques from traditional paper printing, chemical formulations from the paint industry, and micro- and even nano-scale lithography from IC manufacturing. At NextFlex, we help our members optimize these techniques through technology roadmapping activities and on our pilot line where manufacturing and electronics assembly processes can be tested and proven. Flexible, hybrid and printed electronics are now being designed into a wide range of products entering the market today, in both consumer and industrial segments. These products include human health and performance monitoring systems, structural health monitoring (roads, bridges, buildings, etc.) soft robotics, and array antennas, just to name a few. Flexible and printed electronics applications are becoming real. Forecasters are predicting a nearly $30 billion market for internet-connected devices in a combined industry and consumer sector. Of those, healthcare is currently the strongest FHE segment, where performance is of the highest value and reliability is life-and-death critical. By packaging electronic components on a flexible stretchable substrate, technologies enabled through these innovative manufacturing processes will preserve the full operation of traditional electronic circuits in wearable and conformable architectures. These highly functional devices can be attached to curved, irregular shapes and stretched across buildings, objects, and humans leading to 21st century applications. Demand is high for increasing the manufacturability of all of these products. Current research efforts are aimed at lowering the per unit price and increasing value to the customer. The result will be lightweight, low cost, flexible, comfortable, stretchable and highly efficient smart products with innumerous uses in the consumer, commercial and military applications.